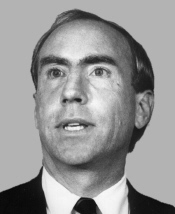 Gerry Eastman Studds ( /ˈɡɛri/; May 12, 1937 – October 14, 2006) was an American Democratic Congressman from Massachusetts who served from 1973 until 1997. He was the first openly gay member of Congress. In 1983 he was censured by the House of Representatives after he admitted to an inappropriate relationship with a 17-year-old page. Gerry Studds, born in Mineola, New York, was a descendant of Elbridge Gerry, the governor of Massachusetts who is commemorated in the word ' gerrymander'. The son of Elbridge Gerry Eastman Studds (an architect who helped design the FDR Drive in New York City) and his wife, the former Beatrice Murphy,  he had a brother, Colin Studds, and a sister, Gaynor Studds (Stewart). Studds made his first run for Congress in 1970, but lost to the incumbent Republican representative, Hastings Keith, in a close election. In 1972, with Keith not running for re-election, Studds won the 12th congressional district seat. He moved to the 10th district seat after redistricting in 1983. "...I have foremost in my mind the need to protect, to the extent it is still possible given the committee's action, the privacy of other individuals affected by these allegations," said Studds. "Those individuals have a right to personal privacy that would be inevitably and irremediably shattered if I were to insist on public hearings...."
After retiring from Congress in 1997, Studds worked as a lobbyist for the fishing industry. Studds previously worked for two years as executive director of the New Bedford Oceanarium, a facility still under development. The Gerry E. Studds Stellwagen Bank National Marine Sanctuary, which sits at the mouth of Massachusetts Bay, is named for Studds. ^ 1968 In America, by Charles Kaiser. ^ Roberts, Steven V. (1983-07-21). "House Censures Crane and Studds For Sexual Relations With Pages". The New York Times. pp. A1, B22. ^ "Studds Gets Standing Ovations At First Meeting Since Censure". August 12, 1983. ^ Pianin, Eric (1983-07-15). "Committee Recommends House Reprimand Two For Sexual Misconduct". The Washington Post. pp. A1. ^ Boston Globe, July 15, 1983, pg 1. ^ a b c Cave, Damien (October 15, 2006). "Gerry Studds Dies at 69; First Openly Gay Congressman". The New York Times. Archived from the original on May 25, 2012. ^ Lindsay, Jay (October 15, 2006). "Studds, 1st Openly Gay Congressman, Dies". Associated Press. Archived from the original on October 20, 2006. ^ LeBlanc, Steve (2006-10-18). "Congressman's spouse can't have pension". Washington Post. Associated Press. Retrieved July 3, 2013. ^ Gerry Studds's widower: DOMA ruling gives gays 'a seat on the bus' Boston Herald. June 26, 2013. Retrieved July 3, 2013.